My friend wanted something different besides the common colour of red and pink for their wedding card. I suggested orange as it is such a groovy and cheerful colour. 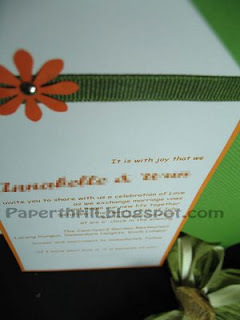 And since it's a garden party, I added a hint of green by using a mossy grosgrain ribbon to the card. Both these colours complement perfectly. 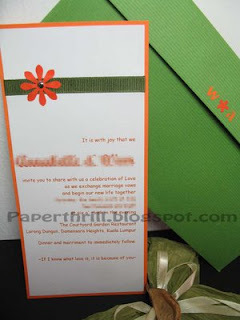 To personalize the card even more, I punched out the couple's initials and attached it to the back of the green envelope. They were very happy with the end results.